When you enrol on a CNM Diploma. This set of 20 pre-recorded DVDs will assist you in becoming a successful practitioner. 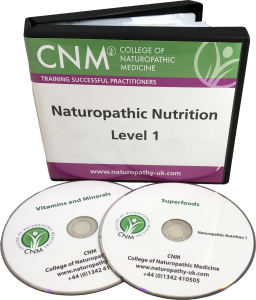 Subjects include: History and Philosophy of Naturopathic Nutrition, Chemistry and Biochemistry, Vitamins and Minerals, Proteins and Amino Acids, Functional Medicine, Disease Triggers and Superfoods and many more. This offer cannot be used in conjunction with any other offer. Availability subject to stock and assigned on a first come, first served basis. CNM reserves the right to end the offer at any time. No cash alternative will be provided. All promotional imagery for illustrative purposes only. Should you cancel your enrolment under the provisions afforded in the course’s terms and conditions, and be eligible for any refund, then €150 inc vat will be deducted from any monies due to cover the cost of the DVD set.